Smith & Wesson’s new M&P SHIELD™ is a slim, concealable, lightweight, striker-fired polymer pistol. Available in 9mm, the new M&P SHIELD features a slim design combined with the proven and trusted features found in the M&P Pistol Series. From the pistol’s easily concealed one-inch profile to its optimized 18-degree grip angle, the M&P SHIELD offers professional-grade features that provide consumers with simple operation and reliable performance. Is this gun semi auto? I found this answer very helpful!!!! Thanks for the info, I couldn't find this answer anywhere. Maybe you should not own a weapon! “It depends on what the meaning of the word 'is' is." Maybe you should take up chuckin' rocks. Can this be bought for California use ? BEST ANSWER: If you live in Cali your money would be better spent on a ticket out of that state or a few tanks of gas. See other replies, this reply is a political stunt. I thought only sling shots were legal in CA? Slingshots are only legal if they are registered and the owner can only use an ammo pouch that holds less than 10 marbles. We do have baseball bats, and shreiking liberals... so we got that goin for us. Typo on my part: Ca version of this is 187021. With hi viz it's 11905. Carry kit is 12550.
no, ca model is #180021; this is #180021. not on roster (no loaded chamber indicator). Shouldn't you know that if you live there? Yeah cause everyone holds an FFL and knows exactly what is and isn’t on the roster. If I were you, I'd move to Idaho. Strike industries sales a product called an E.M.P which will add plus 1 to the 8rd mag and 2 to the 7rd mag. Great quality and easy to install. Does it qualify for free shipping? Qualify for free shipping ?? Does this product have a safety? We don't care what you would or wouldn't own. First of all, you could just not use the safety. It's not like it comes on automatically. Second, you can use that second that it takes you to draw to operate the safety. It's very easy and doesn't use any more time unless you're the guy that has to draw, then look at the gun and find the safety, then use the index finger from the other hand to switch it off. who voted this as "best answer"...it does not even answer the question. it's one know-it-all's opinion on manual safeties, which by the way is only really an issue if you don't train for it buddy. That's some pretty dramatic thinking there, Tex. Anticipating a showdown at high noon? Yes it does but I m pretty sure they make one without the safety I’d rather have the safety feature,it doesn’t get in my way ,use it or lose it . Great choice of weapon. The 180021 model has a thumb safety - other models do not. I would not buy a gun without a safety. When you flip that lever down you are committed to pulling the trigger. Ridiculous statement. Disengaging a mechanical safety commits you to nothing. How is this the "best answer"? Absolutely! You are never "committed" to firing a round just because you dis-engaged the safety. Interesting, because I would never carry a PDW that had a thumb safety and would never recommend a pistol with a thumb safety for others as a PDW. Pete C is correct. "When you flip that lever down you are committed to pulling the trigger." David D, please stop spreading information indicates a lack of credentialed training in simple OODA loop doctrine, let alone common sense SOP regarding a proper (4-count) draw stroke. Yes this one has an external safety. Mine does, but I believe you can get it with or without the thumb safety. Yes it does have a safety. Some will laugh at the word "safety" but remember this, you can always decide to NOT use the safety on your gun BUT you cannot always add a safety to your gun! Safety is located in your head between the ears.....it's called a brain. Yes, the one I purchased came with a manual safety. Is there a magazine that holds more than 7 8 rounds for this specific gun ? BEST ANSWER: Mag guts make a set of parts that fit internal to the existing magazine. Several companies make baseplates that increase capacity. Tyrant adds to the shorter mag. Strike industries make a (relatively) inexpensive plastic one. Hyve makes a metal one. My personal favorite is from Barracuda tactical- metal, well made, comfortable, very pretty and it works reliably (10 rounds)! To my best knowledge NO. Maybe some off brand that will fail like PROMAG or ETS. Stick with factory mags, gun designed for that. Yes I knew that, if it is PEARCE extension works great, looks good. If not best suggestion is factory mags only. I have 45acp shield, no replacement for size. Jamie S the above answers was meant for your question. 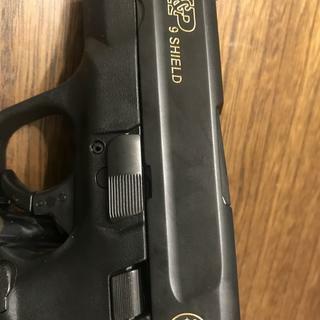 Strike Industries EMP for M&P Shield. You can get Hyve extensions for these mags. Yes, Magguts sells a spring kit in +1 and +2 configuration. The +1 does not add any length to the magazine. The +2 adds about ¼ inch. I've been using them for several yeas and they have been completely reliable. I believe there is a company that makes a 9-10 rnd one. However there are 2 round magazine extenders available. You can get reliable extension magazines that hold up to 32 rounds for the 9mm Shield for just under 50 bucks. Go to Google and they will give you several options. Not that I’ve seen. 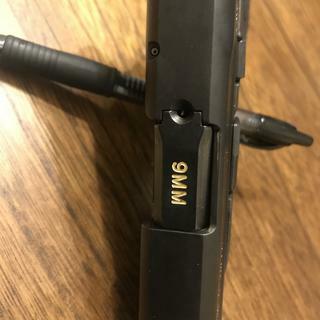 I use the 8 round. Is this deal available without the safety? Doesn't have a safety, so yes. Is this the 2nd generation model? BEST ANSWER: The one shown in the photo is 1st gen. A second gen would have 2.0 stamped on the slide. First generation. Still a great deal for this pistol. No. It was a first gen model. How many mags does it come with ? BEST ANSWER: Hey Dale! I purchased this last Christmas. It comes with two mags. One that holds 7 rounds and a slight extended one that holds 8. 2 magazines come with it. One 6 rd flush magazine, and one 7 rd extended magazine. Very nice weapon, I was surprised to the overall quality of fit and finish. Adjustable sights, but accurate right out of the box. I didn’t have to make any adjustments, just shoot! It comes with two. An extended one and a standard one. 2, 7 round and an 8 round. 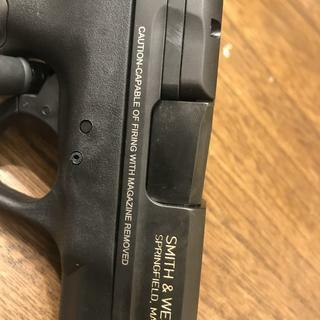 Is the smith n wesson MP 9mm handgun California legal ? BEST ANSWER: Nope. It’s the first version. HOW MANY ROUNDS DOES IT FIRE OR HOW MANY DOES THE MAGAZINE HOLD? BEST ANSWER: It has a 7 round magazine and one 8 round magazine so it would be 7 + 1 in the chamber and 8 + 1. As long as you keep feeding the machine it keep firing till you run out of food. 7+1 or 8+1, depending on which mag you use. 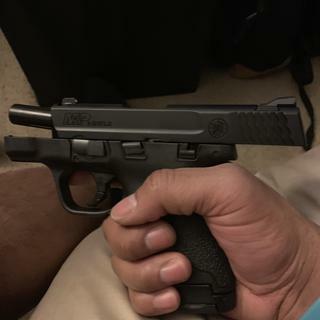 It comes with a regular mag, I’m assuming for someone with a smaller grip and an extended mag for largest grip, which gives you the benefit of that extra round. Flush mag holds 7, full mag with pinky extension holds 8. Add one in the chamber of course. 2 magazines come with it. One holds 7 rounds and the other one 8 rounds. You get two mags with the gun. One 7 round mag and one 8 round mag. Mine came with 2 clips. One holds 7 rounds and the other holds 8. I am India so how I buy this gun? Does this version have the safety? Yes, but I would prefer it without the safety. You can pick the one that does. Yes, it has a thumb safety. Is this model CA compliant? BEST ANSWER: The computer sent this question to me. I purchased this item about a year ago & love the trigger. I used it to qualify for my CCW class with only 2 off target between 5 & 50 yards. I don't work at the store, but they have this statement about California buyers on their website. If you type in a California address when you order it on-line & it goes through, then it must be a legal sale in my opinion, otherwise they couldn't sell it to you. Also, you would have to pick it up at the FFL. They would definitely stop it, if it wasn't ok. If I purchase the gun online can I pick it up in store? is this gun on California Roster? Does this weapon come with two magazines, 1 flush and 1 extended? It is a very good beginner handgun and all around CC. Yes, one 7 round magazine and one 8 round magazine. Is this the 2.0 model or the prior model? BEST ANSWER: This is the original or 1.0. I own two of them personally, and would recommend this over the 2.0 for the difference in price. This is the first edition model. They are worth every penny. This is not the 2.0 model, it is the prior version. Is this one California Legal ? Is this handgun calif legal ?? Does it have 2 magazines? Yes. It comes with one 8 round mag and one 7 round mag. Yes, it comes with an 8 round mag. and a 7 round mag. Yes, a 7 and a 8 round magazines are included. Mine came with 1- 8rd mag and 1- 7rd mag. Yes. One extended and a standard. BEST ANSWER: No. It's a striker fire pistol. It cannot. The trigger is a striker fire action which is a type of single action. Does not have re-strike capability. must reset the trigger via racking the slide. The Shield has no restrike capability. How many magazines come with it? BEST ANSWER: I purchased mine from PSA almost a year but if I recall, it came with 1x 7rd and 1x 8rd. I ended up buying several more mags from PSA as well. I got 2. 1 normal and 1 with an extra extension for a better grip. Mine came with two magazines. Can you add a laser sight? BEST ANSWER: Yes you can. 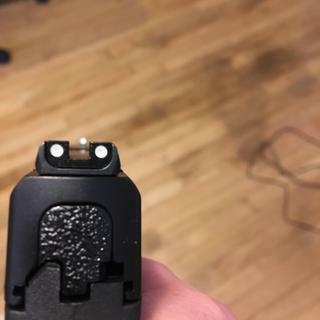 There are also flashlight attachments that can be added as well from companies such as streamlight, crimson trace, lasermax, and centerfire laser. yes there are a few different companies that supply them, just look them up on the web and pick the one that fits your price and options. I believe Crimpson Trace makes an add-on laser specifically for the Shields. Some Shields have them as a part of the gun when purchased. Is this a new pistol? I ordered one on January 13, 2019, picked up at the store on January 29. The manufacture date on the box was January 10, 2019. They are only selling BNIB in the regular listings. It would be noted if they were demos or something. This is the first generation model. The latest gen is the 2.0, with the upgraded trigger. How many magazines does this deal come with? Mine came with one 7 round and one 8 round. 2. One is an 8 round and the other a 7. Is this gun new or refurbished? BEST ANSWER: Mine was brand new when it arrived. A couple thousand rounds later it's still working flawlessly. Brand new, gen one mp shield! Hi Monica, the gun is new. New in box. Great deal! New as far as I know. Does it come with an extended mag? BEST ANSWER: I bought two of the 9MM Shields, both came with 1-7 round and 1- 8 round mags. Yes, it comes with one 7 round and one 8 round magazines. yes sir. has two mags fuse one and an extended one. Yes this product comes with the extended mag. Yes. One standard and one extended magazine. Does it come directly to my home or have yo go to a gunshop? BEST ANSWER: You will need to have the gun shipped to a participating gun shop and pick it up there. It haS TO GO THROUGH AN ffl. Unless you have an FFL it has to go to a gun shop. They generally charge a fee. Roughly 30$ on top of what you pay for the gun plus the sales tax. Ships to your closest gun shop. does the gun purchase have to be sent to a local gun shop? BEST ANSWER: The gun has to be sent to an FFL.Many gun stores are FFL's so it could be sent to a gun store as long as it is an authorized FFL. Not nessacerly. It can 've sent to anyone that has an FFL and will do Tue transfer for you. Now typically that is a gun shop unless you or someone you know, knows an FFL. Yes. An FFL has to send a copy of their liscense to Palmetto before they can send the gun to a gun shop of your choice. Yes. It has to ship to a local FFL, which you select sometime in the checkout process. felony? No gun for you! Outstanding gun! One of the top name brands in weaponry. PSA shipped it pretty quickly. Once I recieved the gun it was in great condition and well oiled. Due to busy schedule, I haven't been able to get lead down range. So, I anxious to do that. . The shooting experience was surprisingly like my full size M&P, despite my pinky having no place to grip. The 8-round magazines offer more grip area, comfort and control. It's light and comfortable for carry. Win win. This is simply the best carry gun on the market. It way outperforms other guns at this price. Same level of reliability as Glock/Sig. I actually prefer it over my Glock 43. 200 rounds through it out the box. It works. No real disadvantage versus the Shield 2.0. I bought the gun when it was on sale a PSA. I love it. I've shot 150 through it so far and it worked flawlessly. I absolutely love my shield, carry it everywhere, for hours at a time. The Shield series is fantastic for an all around pistol that is easy to carry and easy to shoot. For me the grip is perfect particularly with a +2 magazine extension. 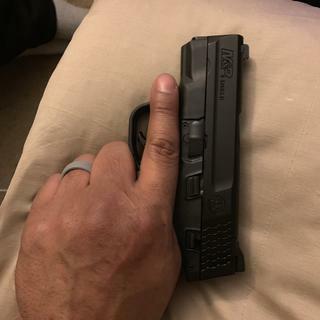 The size is small enough for edc but big enough to absorb enough recoil that my wife brought one of her own. Great gun for the price. It’s my concealed carry firearm. Shoots great has good sights. I received my new S & W Shield 9mm 3 days ago....had to play hooky from work to go shooting! 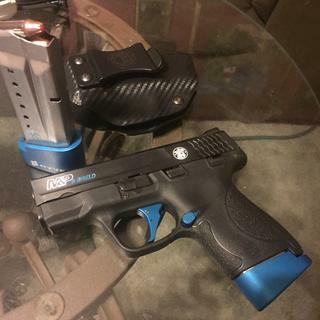 Awesome gun...awesome price, awesome service, and due to my purchasing 1 Taurus G2C with free shipping & 1 S & W Shield without free shipping, upon a polite request, PSA refunded my shipping ($17 hard earned bones) because I had both shipped to the same FFL in the same purchase. Come on gang....how do you get better than a S & W Shield 9 mm for this price and the awesome Americans helping Americans at PSA with their great customer service, their logical response to a polite request?? PSA will be my gun source for life-which translates until my wife sees how many guns I have bought this year....OMG it is only March.....I am addicted to the deals on PSA!! Thank you PSA. Extremely happy with purchase of this pistol. Excellent pistol . Accuracy is great . Does have a little recoil for 9mm but is expected with such a lite compact concealable pistol . I would love to give this little guy 5 stars, except it has one little hiccup. It cycles properly, im pretty accurate with it, and Palmetto did a great job on their end. The hiccup is the fact that mine has a striker that drags on the primer. So far it doesnt affect shootability, but im only 150 rounds into it. Other than that, no problems! Would recommend for a good carry gun. Shoots well for a small gun. No jams or misfires. Would suggest talon grips to go with it. Finishes off the guy. The Shield is a great concsealed carry. Good price, and add a Streamlight LT-6, and you can still get holsters that are fitted for the combo. Have two of them! Added Hyve magazine extensions to both mags, Hyve extended mag release,Hyve slide rear plate, Apex trigger, nice,slim, and accurate. 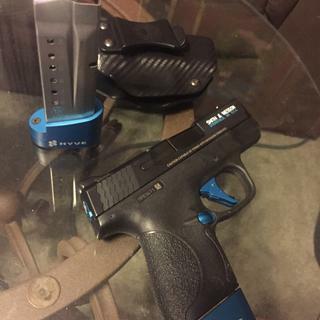 I’ve enjoyed mine since I bought it, great little gun. Delivered quickly. Showed up in excellent condition. Transaction was very smooth. Would buy from them again. Very happy with purchase. Super price for a quality pistol with pocket carry in mind. I have the Shield in .45ACP and had the opportunity to shoot a 9mm Shield and it fit my hand nicely and accuracy was good. Great CCW gun. Highly concealable and extremely reliable. Also, the price at PSA was very attractive. Super reliable and very easy to carry in my CYA Supply IWB holster. Best carry gun for me in the best holster. 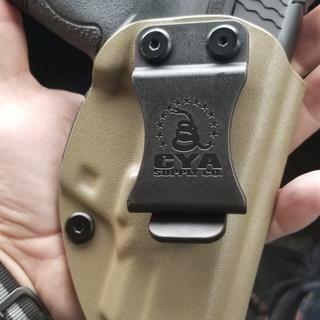 Great gun, easy to carry in a great CYA Supply Co holster. Great weapon, but needed to have a clip loader included, my wife’s only complaint. I purchased this for my wife, small/lightweight and she loves it. She is having a problem loading as the clip spring is very tight. I’m going to buy a clip loader, which I believe should have been included, so that she can really enjoy the weapon. Top quality firearm, sized for concealed carry, easy to use. This is a quality, well made, firearm, sized for concealed carry. 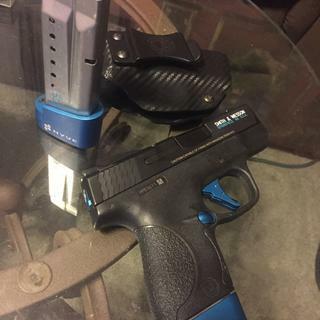 The only complaint I have is the takedown for cleaning is not as easy as a glock or the taurus g2c. The trigger is firm and requires deliberate force to fire. This gun is excellent for men as well as ladies. Great product at a great price. Less expensive than my Sig-938 but just as fun and reliable. Some say the trigger is a little stiff compared to the newer model, but I have no complaints. Excellent little concealer. Terrific price!! If you are Active Duty or Veteran with VA ID card, Smith & Wesson offers their "thank you for your service" rebate. For the M&P Shield, you will receive a $40 rebate. Valid until 30 Apr 2019. See website. I have zero affiliation, just sharing for my brothers and sisters in arms. The only issue I had was that I was missing a magazine. But the ffl was sketchy so they probably took it. But other then that it was great. $250 new! What other high quality brand firearms can you get for that? 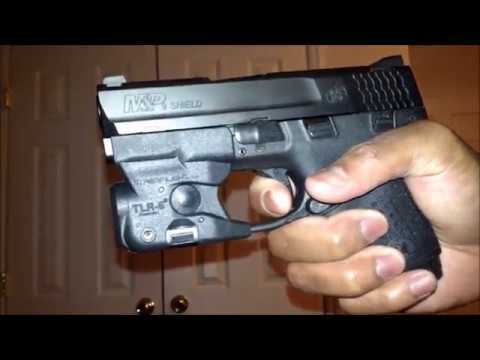 Awesome gun if your looking for a good, reliable concealed carry pistol! I love this gun so far. 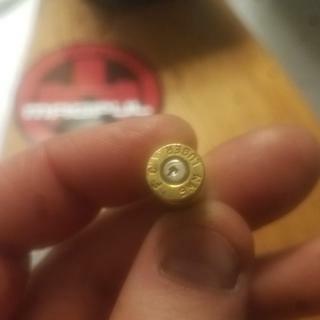 I have put a little over 200 rounds through it with no issues outside of issues with bad ammunition (would jam my friends Glock as well haha!) I would definitely recommend this gun to others. You can field strip it easily, looks good, feels good in the hand or atleast most of the people who shot it. The only complaint which really didn’t bother me that much but would like to upgrade in the future is the trigger, but when you pull it, it fires and thats all that matters. 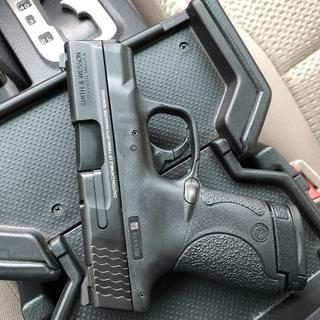 Great concealed gun and looks good when it’s out. Love this little gun. Have run several hundred rounds thru it not one failure. Highly recommend at this price. I love my S&W, it's small enough for the perfect concealed carry for me. I do like the 8 round magazine for the extra length so got an extra one. Have no complaints, nice weapon for the money. 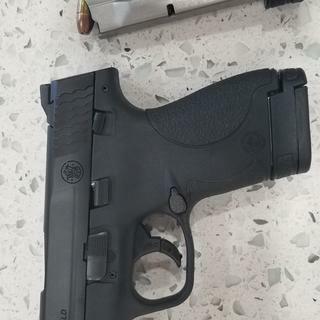 M&P shield or Shield 2.0? 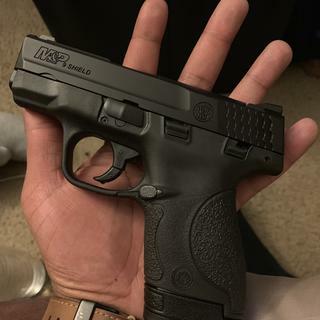 S&W M&P Shield 9mm, Perfect for my needs. I was looking for a conceal carry that I could also shoot with a degree of accuracy. I found both at a price I couldn't pass up. Very satisfied! Love the gun and price-$250!!! I'd rather buy two at that price over a p365! No question, the M&P is a great little gun. I also bought a fobus paddle holster to fit. It does stick out quite a bit under my shirt. I may look at a holster that conceals more. Any ideas? I am a big guy and really can't carry IWB. I thought about a zip away side pouch. at $249 the shield is a great buy . its not the m2 model but the original is still a great ergonomic weapon at a great price !!!! Great pistol, especially at its price point. Great little pistol. 100% reliability through 350 rounds shooting JHPs and FMJs. I trust it completely and bought it for a great price at PSA. Easy conceal carry, very accurate, I would recommend this gun for conceal carry. Great price on a great gun. Quick delivery ,out of the box accuracy was spot on! PSA rocks! Good price for a nice ccw pistol. Best company I have ever delt with when buying a gun. Shipping got messed up by UPS and delayed the gun 10 days. Palmetto refunded me the full price on the gun and I got to keep the gun. I never even asked them to do that. Top notch company . Great deal from PSA. Excellent shipping and great handgun . Lightweight, small but just big enough for a good grip. A great buy. Close to perfect carry gun. Slim profile and reliable.